Having won numerous multi-million dollar verdicts for clients, including construction accident and personal injury cases, Perecman is honored for third straight year. 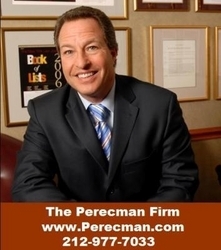 New York, NY (PRWEB) May 28, 2010 -- David Perecman, one of New York's top personal injury attorneys, has once again been selected as one of the best lawyers, in the top 5% of lawyers in the country by his peers in SuperLawyers magazine for the third straight year. "Each year I am honored to be nominated by my peers and recognized as one of the top 5% of lawyers and among the best lawyers. Our firm continues to be aggressive and works for our clients to ensure they are satisfied with the outcomes of their cases," said the New York personal injury attorney Mr. David Perecman. Having over three decades of practicing law, the New York personal injury lawyer has won numerous record setting multi-million dollar verdicts for clients. In 2005 alone, Mr. Perecman recovered over $25 million in verdicts and settlements for clients who were injured in various cases such as construction accidents, medical errors and much more. He was just honored for the third largest construction accident verdict in New York this year. Years prior, Mr. Perecman had one of the highest verdicts in the entire state in 2004 and two of the top 15 verdicts in 2005. His client was recently awarded a 5.35 million dollar verdict which may well become one of the highest in 2010. "Whether they fall in a building, fall off a scaffold, get injured when they fall from a ladder or are victims of malpractice, we represent and help them get what they deserve", says Perecman. For the past 30 years, the New York personal injury lawyers, auto accident, construction accident, and medical malpractice lawyers at The Perecman Firm, PLLC have championed all types of cases for personal injury accidents. David Perecman, founder of the Firm, is a Board Director and the past Secretary and Treasurer of the New York State Trial Lawyers Association (NYSTLA) and a chair of its Labor Law Committee. Mr. Perecman's achievements have brought him recognition as an Honoree in the National Law Journal's Hall of Fame, in New York Magazine's "The Best Lawyers in America" and The New York Times Magazine "New York Super Lawyers, Metro Edition" for the years 2007-2010.